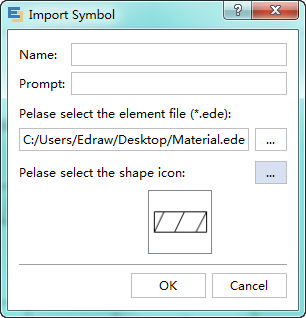 Apart from using built-in library materials, Edraw also allows users to create their own libraries with custom symbols. This simple guide below will tell you how to build and manage your own library. Click Create Library From Images button. On the pop-up window, choose a file folder which includes the images you want to make as library elements. Click Ok. You will see a new library is created in the library panel. You can remove a library element when it's unnecessary. Right click the shape. 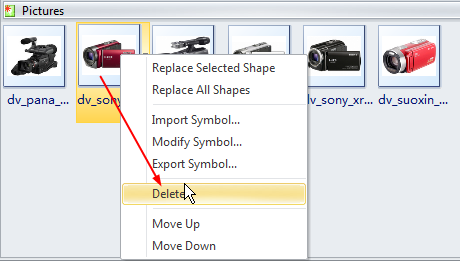 From the context menu click Delete to eliminate the shape. You can also change the element order by clicking the Move Up or Move Down item. You can change the element name by clicking the Modify Symbol... item. Switch to Symbols menu, and use drawing tools to draw your own shape. Take the Material symbol as an example. You can use the Rectangle tool and the Line tool to draw it. For complicated shapes, use Pen or Pencil Tool. For more details, please click How to Use Pen Tool and How to Use Pencil Tool. Click Rectangle. -> Hold down the left mouse button and drag on the blank canvas. Switch back to Select mode. -> Select the rectangle. -> Resize the rectangle by dragging the square handles. Click Line tool. ->Hold down the left mouse button and drag 3 lines within the rectangle. Switch back to Select mode. -> Select the line, when the pointer is a four-head arrow, hold down the left mouse button to move the shape. Drag the square handles to resize the lines. Press F4 to edit shapes more accurately through Property function. Enter the relevant value based on your target shape. Select all lines and the rectangle. -> Click Group on Home tab. After they are grouped, they become a single shape. After you complete the drawing, you can add connection points around the shape. Select the shape, and choose Add Connection Points Automatically on Connection Point Tool. To add a text above the shape or with control point, go to Text Tool. Switch to Symbols menu, click Save Symbol button to save the shape as library element. Then you will get two files respectively in .ede and .bmp formats. Right click on the blank area within the library. Enter the name and prompt for the shape. Select the .ede and .bmp file you just saved. In the Library menu click New Library button. A blank library template will be created in the library pane. Right click the blank area of the template window. Then click Import Symbol button. 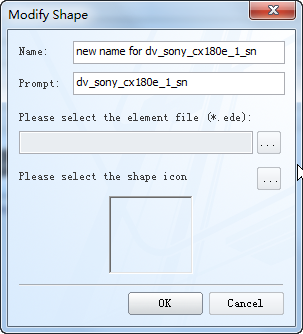 On the Add Shape dialog, you can edit your shape's name and prompt, the most important thing is to select the .ede and .bmp files saved before, click OK. The new shape will be added in the library template. 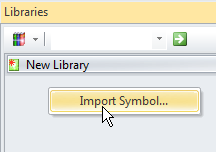 Right click the title of New Library and click Rename Library option to change the name of your library. Press Enter key to save the new name. Don't forget the most important step. Save the library so that you can use next time. Right click the title of New Library and click Save Library. Choose a saving place and remember the route for next time opening. Please read Editing libraries for more information.